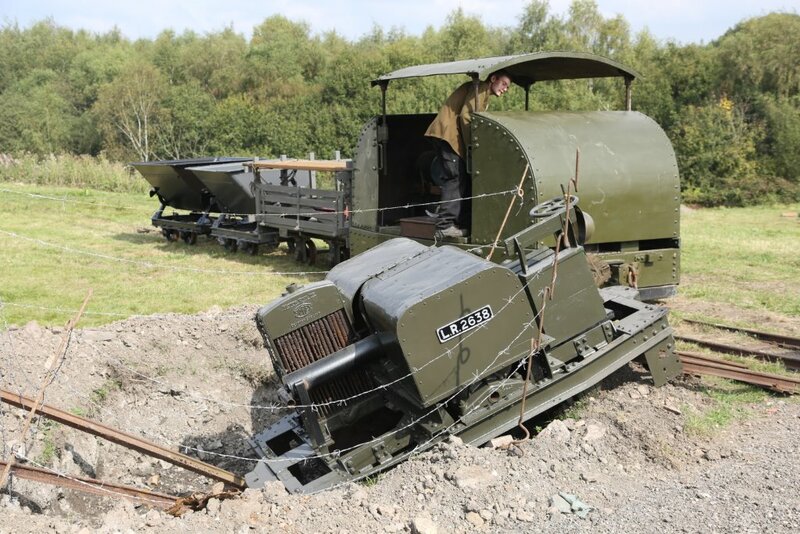 The story behind the bent-frame in the shell hole…..
Perhaps one of the most photographed locomotives at “Tracks to the trenches 2014” was an out-of-use, little 20hp Bent-Frame tractor that was located in a shell hole near the main field area. This certainly attracted much comment and was a surprice (previously unadvertised) feature. Forward area light railways and tramways were often operated under the cover of darkness. Being so close to the front, they were always easy targets for the enemy, and were often damaged through shelling. 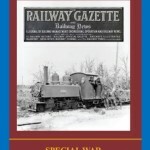 According to contemporary reports, although the tracks were regularly inspected, it was not uncommon for locomotives and trains to often become de-railed through recent enemy action. When this happened, the priority was to remove any ammunition and get the railway operating again. 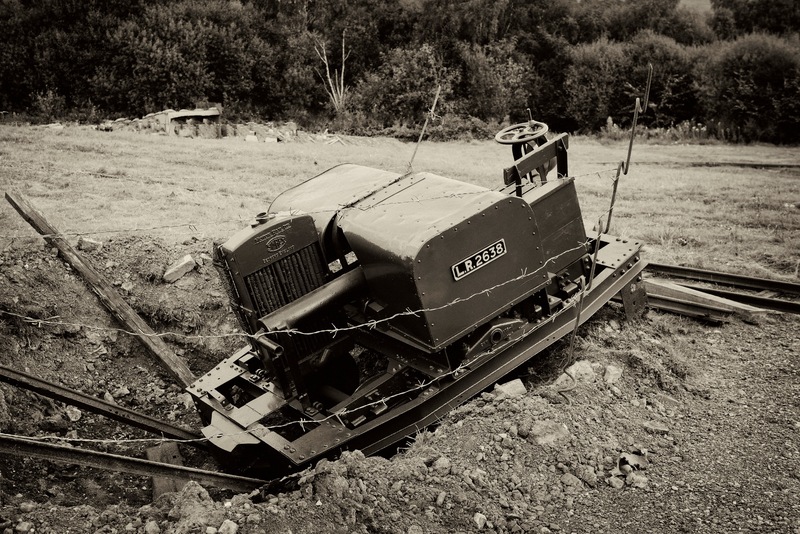 Locomotives could be left for days/weeks until there was an opportunity for recovery (again – mainly at night!). These little 20hp tractors were sometimes known as “Wizz-Bangs” (also the name for in-bound enemy shells) – due to their high speed/acceleration and their regular tendancy to back-fire. 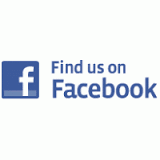 They were a particular favourite with the railway/tramway operating companies. Our cameo scene represented a locomotive that had been driven into a previously unseen shell hole at night. Whilst awaiting recovery, the railway had been diverted around it and the wagons long since removed. The aim of this little scene was to provide a poignant reminder of the risks that the Light Railway and Tramway companies were taking every day, in their continual battle to keep the men in the trenches and the guns supplied. 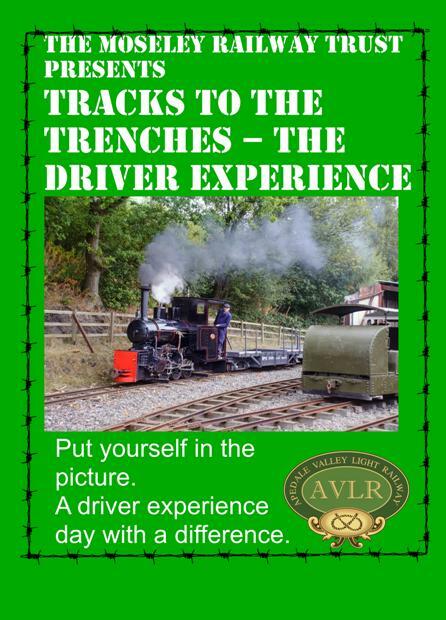 Stop-Press – more locomotives and equipment head to the Trenches…..
We are pleased to confirm that 2 more locomotives have now been added to the line-up at Tracks to the Trenches. Armoured MotorRail 435 of 1917 (WD number 2156) is coming to us from the Ffestiniog Railway/Mike Hart – this locomotive, exported to St Kitts after WW1, was re-built to its current form a few years ago and is normally resident on the Ffestiniog Railway. As a 1917 built Motor Rail, and a very low works number, we know that this machine saw active service in France during some of the main fighting. The 2nd loco is somewhat different – A Kerr Stuart “Wren” (number 3114), built in Stoke-on-Trent in 1918 whilst Reginald Mitchell (designer of the Spitfire WW2 Aircraft) was serving his apprenticeship in the company. This is diminutive locomotive, representing the home-front, was built for the Ministry of Munitions and worked at an armaments dump in Driffield during the war. It has been restored and is normally based on the Vale of Rheidol railway. 3114 will also be accompanied to Apedale with a German Wasserwagen – these water tenders were often seen with the “Brigadelok” locomotives. 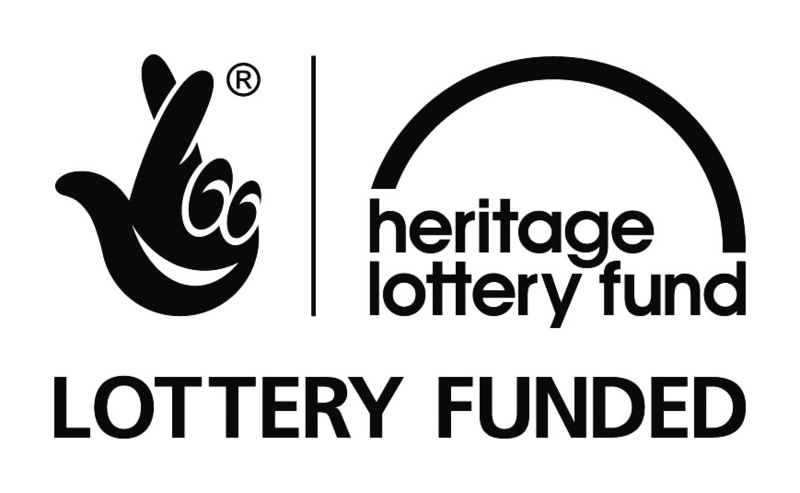 We are extremely grateful to both organisations for their help and support towards Tracks to the Trenches. 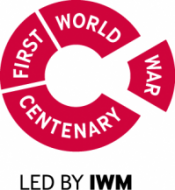 War and Peace – a taster! 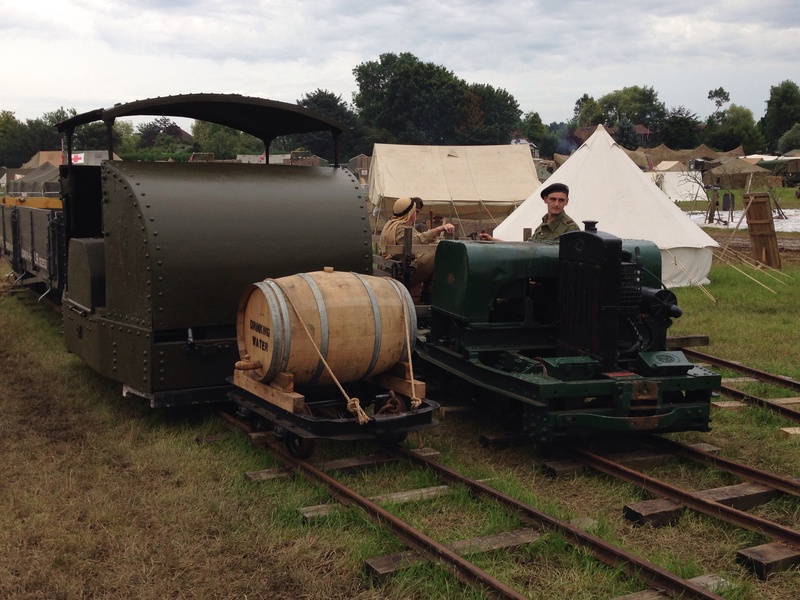 The Moseley Railway Trust has – for the second year – been operating a temporary railway at the War & Peace Revival military (mega) show in Folkestone. This year, Apedale resident Motor Rail 2197 was joined by Amberley’s MR1381 “open” 40hp Simplex- which was even repainted for the event. The gathering of these locos and the British Class D & P open wagons, plus a typical trench tramway water carrying wagon, provided some tantalising tasters for our own event in September!